Charlotte School of Law is a For-Profit, Non-Sectarian, Law, College established in 2006. 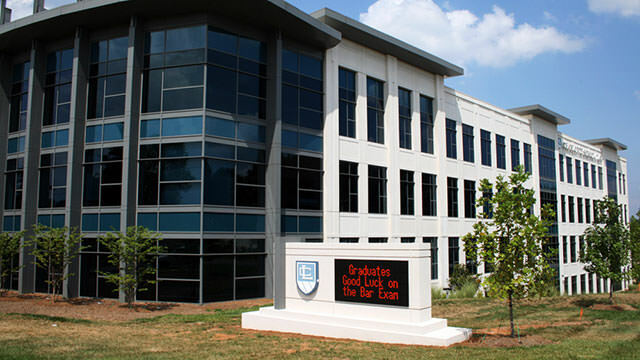 The campus is located in Charlotte, North Carolina, USA and hosts 1,151 (2011) students with an endowment of $0 (2014). This school is the worse school. They accept students they know are at risk of not performing well on the first year of law school and they get pushed into an inevitable abyss of poor performance to ensure they do not have the needed grades to excel on the first year. This is designed to ensure the students are unable or unwilling to transfer since at least 85% of the student body is from out of state and enroll with plans to transfer. The school’s bar passage rate is about 40% and the school ranking is last out of 205 law schools in the United States. This school is under the microscope of the ABA for possible accreditation probation and possible removal. Their tuition is higher than top tier schools like Duke and Wake Forest and yet the school is rated last. This school is part of the infilaw for profit schools conglomerate which is owned by Sterling Partners out of Chicago and all these guys care about is profit and not students success. They force professors to play the school’s very low curve game and when they refuse they get rid of them. Please, please if you cannot get into a better school you are better off doing something else with your student loan money. If you are able to get past the first year in this school and are able to graduate you are going to have a extreme hard time passing the bar if you past it at all and if you do you are going to be tasked with over $140,000 in non-dischargeable debt and with very poor job prospect. This amount of debt would take you 10 years of monthly payments of over $2,500, with job prospects of about $40,000 beginning salary. This mean more than 80% of your salary would go toward paying student loans and with a degree from this school your chances of getting a job in a reputable large firm are nearly none. Do not enroll in this school, you are going to regret it. Must admit, the school is quite impressive and the curriculum, incredibly stimulating! Unfortunately, the lawyering process (or legal writing)professors dont seem to know how to communicate the course effectively to the students. I actually like this place. The administration goes out of their way to have forums for students and to solicit feedback through surveys and whatnot. I can’t say that my undergrad or other grad institution put this much effort into it. THE BEST PLACE TO START WITH ON THE WAY TO BEING A JUDGE.